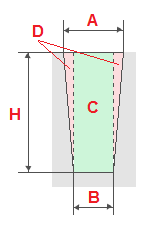 The program calculates the volume and surface area of the trench. If the width of the top and bottom of the trench will be different then calculated Additionally useful volume C and volume of sloped sections D.
For the lining of communications, conduits, sewers or basement tape on your lot, you may need to dig trenches. You can invite to the experts, and you can do this work yourself. But in both cases you will need to know some of the characteristics of the trench. Calculate their help our program. Based on length, width and depth of the trench it will determine its volume and surface area. If the width of the top and the bottom of the trench, also will be calculated and the useful volume of the slopes. Calculation of the volume of the trench will help you not only make your work, but just calculate the cost of ground works, if you do decide to use the services of specialists. There are three ways of digging trenches. This is the digging of trenches by hand, using manual tranšeekopatelâ or tranšejnogo. The first case is usually used where there is no access to the special equipment. It's pretty labor intensive method of digging trenches, which greatly affects the quality of the soil. Manual trench digging machines reduce the time for such works. You can buy or rent. You can also order the digging of trenches in the specialized company. Then it looks professional. The excavator is used where the plot can get construction equipment, as well as where there is a large volume of work. Before you rent a backhoe should find out the width of the bottom of the trench, to pick up the car with the size of the bucket, which she is. If you decide to dig the trench yourself, first of all you should know that for different types of work require a certain depth of the trench. For example, for the laying of cables tend to dig trenches about 70 cm deep. And for sewage requires a deep trench. While it is desirable that the depth was half a meter more depth promerzanija soils. The width of the trench also affects the type of work done. The minimum width of the trench shall be measured on the bottom and must match the type and size of stacked pipe into it.